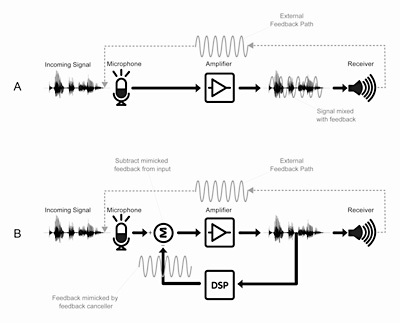 Adaptive feedback cancellation is a common method of cancelling audio feedback in a variety of electro-acoustic systems such as digital hearing aids. The time varying acoustic feedback leakage paths can only be eliminated with adaptive feedback cancellation. When an electro-acoustic system with an adaptive feedback canceller is presented with a correlated input signal, a recurrent distortion artifact, entrainment is generated. There is a difference between the system identification and feedback cancellation. Adaptive feedback cancellation has its application in echo cancellation. The error between the desired and the actual output is taken and given as feedback to the adaptive processor for adjusting its coefficients to minimize the error. In hearing aids, feedback arises when a part of the receiver (loudspeaker) signal is captured by the hearing aid microphone(s), gets amplified in the device and starts to loop around through the system. When feedback occurs, it results in a disturbingly loud tonal signal. Feedback is more likely to occur when the hearing aid volume is increased, when the hearing aid fitting is not in its proper position or when the hearing aid is brought close to a reflecting surface (e.g. when using a mobile phone). Adaptive feedback cancellation algorithms are techniques that estimate the transmission path between loudspeaker and microphone(s). This estimate is then used to implement a neutralizing electronic feedback path that suppresses the tonal feedback signal. This page was last edited on 24 May 2017, at 17:46 (UTC).